Course Info: ABS Master Bladesmiths, Heather and Kevin Harvey of Heavin Forge present a variety of bladesmithing courses. We offer, on a regular basis, Basic Bladesmithing, ABS two-week Introduction to Bladesmithing, Handles, Fittings and Sheaths, Full House (Basic Bladesmithing and Damascus combined), Damascus Steel Making courses. Contact us if you require information on our other courses that we offer, on request, to past students, i.e. Bowie Build, Advanced Bladesmithing, Advanced Damascus and Advanced Blade Grinding. Profile: My interest in knives began at the age of 12. I was introduced to the craft by my late Grandfather who made knives as a hobby. The knifemaking bug bit me hard and I have never been able to give up the habit. Sounds like an addiction? It is! Knife lovers will understand and forgive me! My knives are tested in the field as I enjoy camping, the outdoors, hunting and especially fly fishing. Africa is a tough place to test knives. I completed a diploma in mechanical engineering and worked in a dynamite factory serving my apprenticeship as a fitter-machinist. 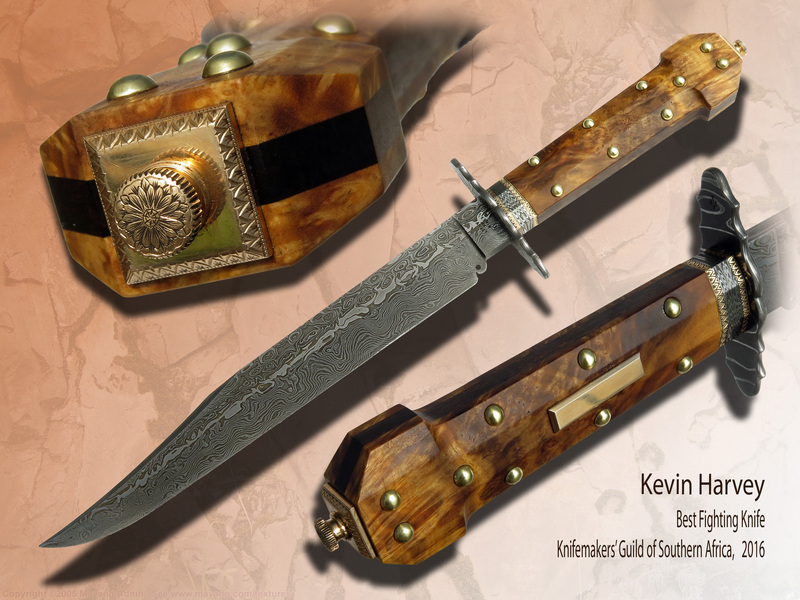 I was accepted as a member of the highly-respected Knifemakers' Guild of Southern Africa in 1991. I am also a Master Bladesmith with the American Bladesmith Society and a founding member of the Southern African Bladesmiths Association. My full-time knife career began in 1996 at Gold Reef City, (a re-creation of Johannesburg as a mining town 100 years ago). Here I met Heather, my wife, and we went on course together to the Texarkana College, Bladesmithing School in Arkansas, U.S.A. in 1998 to learn bladesmithing and damascus steel making. We taught at this school after receiving our Mastersmith ratings in 2001. We both love fly fishing and decided to combine our workshops and move to the country. Here at Heavin (Heather and Kevin) Forge in Belfast, only 2 hours east of Johannesburg, we can concentrate on making the most spectacular knives and have started a knifemaking school, presenting a variety of courses including the ABS approved two-week Intro to Bladesmithing course. Our facility is only the second outside of the U.S.A. with accreditation from the ABS. Highly collectable art-knives are my speciality. 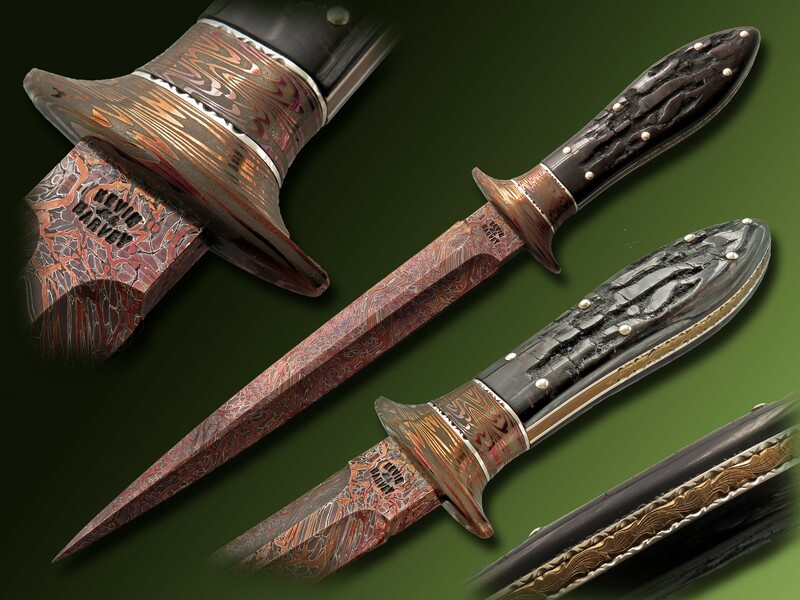 I enjoy Bowies and daggers. I make my own damascus steel and make mainly forged knives. The materials I tend to prefer for knifemaking verge on old style traditional/classical. I am not really into high tech. I like to consider myself versatile and am forever trying something new and don't like repetition and getting stuck in a groove. I am constantly aware that every knife I create has the potential to be the treasured antique of the future. Africa offers some of the most beautiful handle materials in the world and I use hippo, warthog, indigenous hardwoods, leguaan skin, crocodile, catfish skull and any interesting horn or bone available. Each knife is a unique, one-of-a-kind creation, making it special to both me and its owner. I prefer to work on my own inspiration, as opposed to taking orders and directions from clients. The knives I make are part of me. I love designing knives and reading every knife publication I can lay my hands on. Inspiration is everywhere! I do all of my own engraving and embellishment. My knives are sold from my showroom at Heavin Forge, Belfast, South Africa and from my website, www.heavinforge.co.za. I exhibit at our annual Knifemakers' Guild of South Africa show. 2016 annual Guild Show winner of Best Art Fixed Blade and Best Knife on Show. Sole authorship. 4-Leaf Clover mosaic damascus, hot gun-blued. Gold Lip Mother of Pearl handle with heat coloured titanium frame. 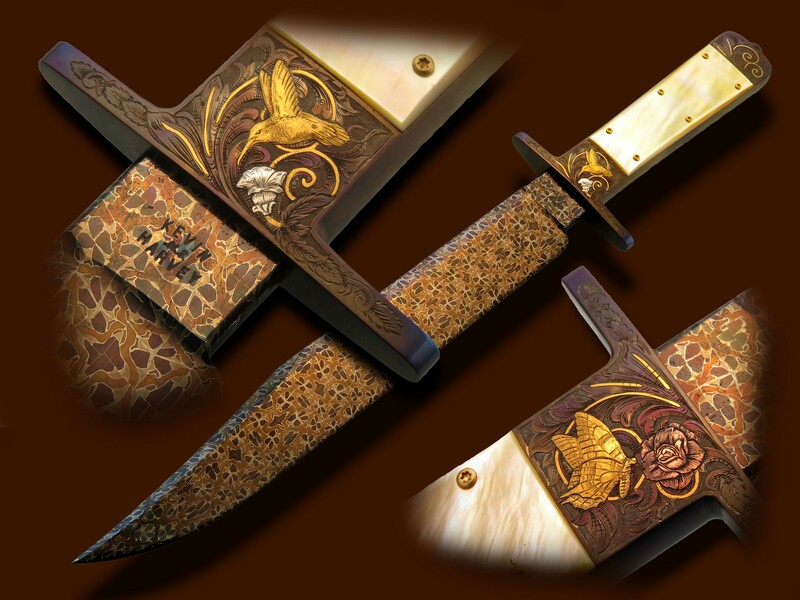 Heat coloured mosaic damascus blade and fittings. Sole authorship throughout. Cape Buffalo horn handle with nickel silver pins and file worked spacers. Frame of engraved and heat coloured titanium. Hand forged and Japanese style clay hardened, 1070 carbon steel. The hamon looks like a mountain range. Handle of Hairy Vitex wood. Nickel silver guard, pin and thong tube. Cowhide sheath with ostrich shin leather inlay. 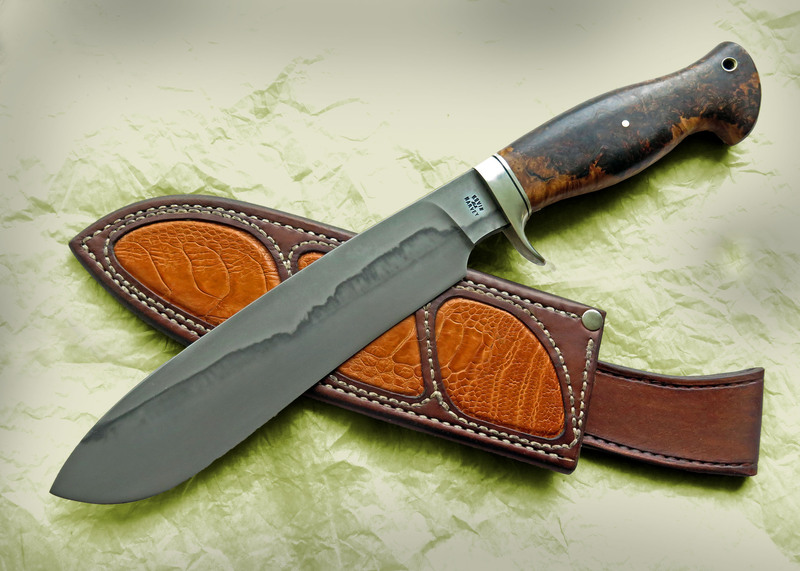 Best Fighting Knife winner at the 2016 annual Knifemakers’ Guild Show. Sole authorship throughout. “Transition” Damascus Bowie blade with Spanish notch. Skunkbush wood handle with bronze fittings engraved by Kevin. Frame of African Blackwood.